To develop and commercialize an ultra-high efficiency generator to power 100% off-grid buildings and electric vehicle based on a newly discovered aspect of physics; the ability to convert the effects of g-force into kinetic motion. Independent Energy LLC is a group of inventors/engineers who have designed a new green energy technology that will fundamentally improve the way the world creates, distributes and consumes energy that is based upon a newly discovered and previously undocumented aspect of physics; the ability to convert the effects of centrifugal force into kinetic motion. 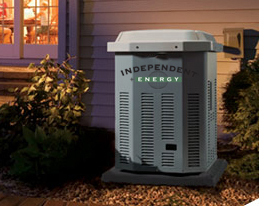 After years of extensive research and experimental verification, Independent Energy, Inc. is ready to build a computer modeled prototype, demonstrating the significant energy savings that can be generated through its new centrifugal-based power generator design. The system is called the P6G Centrifugal Force Generator.